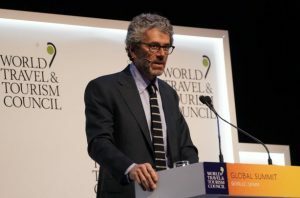 Seville (Spain) – April 4, 2019 (travelindex.com) – The World Travel & Tourism Council (WTTC) has announced the formation of a global taskforce to help prevent and combat human trafficking – an illicit activity that affects 30 million victims worldwide, and relies on travel networks to operate. Human trafficking is present virtually everywhere; yet not all criminalize it in all its forms. 1. PREVENTION: to increase industry and consumer awareness of human trafficking. It is proven the more we know the more can be prevented. 2. PROTECTION: to train employees and travelers on how to identify and report suspected cases. 3. ACTION: to encourage governments to enact legislation which recognizes human trafficking as a crime throughout the entire chain and develop resources and support needed such as national hotlines. 4. SUPPORT: to provide assistance, employability training and employment opportunities to survivors. The founding members of the task force are Airbnb, Amex GBT, The Bicester Village Shopping Collection, Ctrip.com International, CWT, Emirates, Expedia Group, Hilton, JTB Corp, Las Vegas Convention and Visitor Authority, Marriott International, Silversea, Thomas Cook, and TUI.